Make certain the surface to be glassed is completely clean of dust and debris. Whatever you leave behind will be there entombed forever on your hard won boat. Take especial care to keep the fiberglass cloth clean. Given the coarse weave of 6 oz. cloth, it readily picks up all sorts of trash in the shop if set on the wrong surface or left out too long to collect whatever is floating in the air. Be sure to keep glass in a plastic bag to safe guard it from dust & trash. I’ve also read to wear nitrile gloves in handling the glass as oil from your paws can contaminate the weave. Personally I have not been so conscientious and haven’t noticed any imperfections as a result. I do wear the blue nitrile gloves in handling the epoxy. Its nasty stuff to have to remove with thinner or acetone. I’d recommend wearing a size smaller then normal. With a tight fit you hardly realize you have them on and you can work unconscious of the fact they are on. There is a huge difference in the setting time of epoxy based on the temperature. Raka epoxy will set almost 4 times faster at 85 degrees F vs 65-70 degrees. I’d recommend starting your job with smaller batches of epoxy until you have a good feel of how much you can work before it thickens & sets. Epoxy is “liquid gold” and waste here can be costly. Other than time, it is the single largest material cost to your build. Keep a small amount of acetone and clean cotton rags available to clean your chip brush, vinyl scraper, and the inevitable drip or spill of epoxy. Keep your eye out for large cardboard boxes. While hardened epoxy can be chipped off the garage floor, why mess with doing so? Cardboard placed on the floor is more durable and cheaper, if found, than heavy craft paper. On side can be used up, flipped for the second half of the project, and tossed when done. Biased cut glass cloth is a heck of a lot easier to mould around compound curves than square cut. This is never more evident than when trimming out the cockpit coaming. This is a big one. Aside from large areas to be glassed, wet out strips of glass on waxed paper over a flat nearby surface. This will eliminate much of those pesky “hairs” that inevitably find their way into the work. Placing the cloth dry on the boat and working epoxy into the weave with a chip brush can make a horrible sanding job later (guess how I know). Keep any successive epoxy fill coats close enough so sanding isn’t necessary. Read the manufacturer’s literature. All brands are not the same. At 10, it becomes too long a list. Suffice it to say as a newcomer, the process seemed overwhelming. Taking it slow and attending to your work will make all the anxiety fade away. My biggest fear in the build was forming this wonderful strip vessel and then botching it with a rotten glass job. Save for some shadows from using epoxy to fill nail holes, the process moved along just fine. 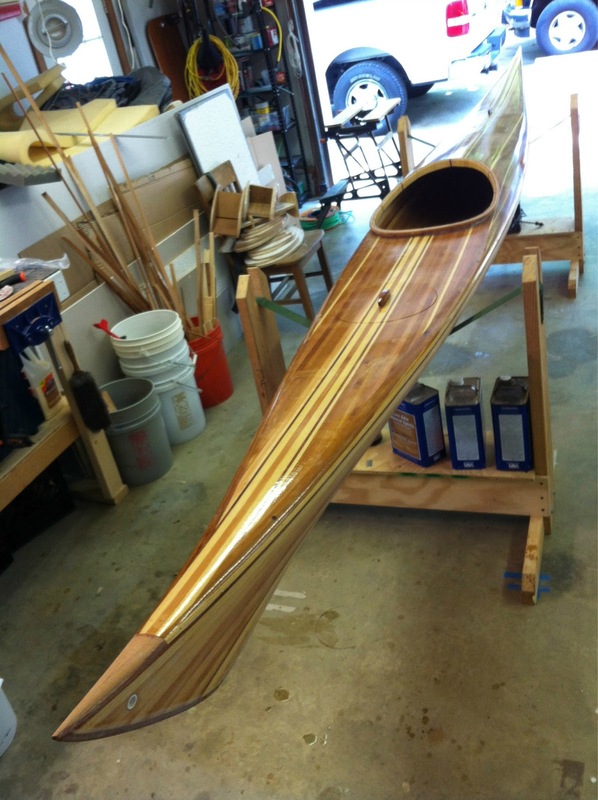 Be patient, work with deliberation, and your boat will be beautiful. I sound like a pro now (far from it). Now we’re ready to glue the halves.